The 25th anniversary edition of Frank H. Netter, MD's Atlas of Human Anatomy celebrates his unsurpassed depiction of the hu﻿man bo﻿dy in clear, brilliant detail - all from a clinician's perspective. With its emphasis on anatomic relationships and clinically relevant views, this user-friendly resource quickly became the #1 bestselling human anatomy atlas worldwide, and it continues to provide a coherent, lasting visual vocabulary for understanding anatomy and how it applies to medicine today. Dr. Netter brought the hand of a master medical illustrator, the brain of a physician and the soul of an artist to his illustrations of the human body, and his work continues to teach and inspire. Access the full downloadable image bank of the current Atlas as well as additional Plates from previous editions and other bonus content at NetterReference.com. Netter's Anatomy Flash Cards are the most convenient and portableway to review anatomy on the fly. This 4th Edition contains full-color illustrations from Netter's Atlas of Human Anatomy, 6th Edition paired with concise text identifying those structures and reviewing relevant anatomical information and clinical correlations. Online access at studentconsult lets you review anatomy from any computer, plus additional "bonus" cards and over 300 multiple-choice questions. This Color Atlas of Anatomy features full-color photographs of actual cadaver dissections, with accompanying schematic drawings and diagnostic images. The photographs depict anatomic structures with a realism unmatched by illustrations in traditional atlases and show students specimens as they will appear in the dissection lab. Chapters are organized by region in order of standard dissection, with structures presented both in a systemic manner, from deep to surface, and in a regional manner. This edition has additional clinical imaging, including MRIs, CTs, and endoscopic techniques. New graphics include clinically relevant nerve and vessel varieties and antagonistic muscle functions. Many older images have been replaced with new, high-resolution images. Black-and-white dissection photographs have been replaced with color photography. A companion website will include an Image Bank, interactive software (similar to an Interactive Atlas), and full text online. Essential Clinical Anatomy, like the authors’ more comprehensive text, Clinically Oriented Anatomy, receives global acclaim for the relevance of its clinical correlations. The book emphasizes anatomy that is important in physical diagnosis for primary care, interpretation of diagnostic imaging, and understanding the anatomical basis of emergency medicine and general surgery. 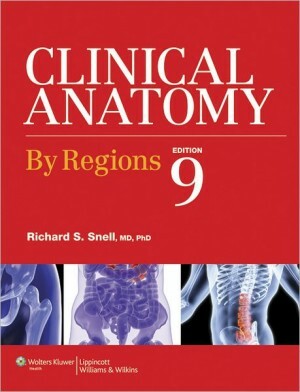 Widely praised for its clear and consistent organization, abundant illustrations, and emphasis on clinical applications, Clinical Anatomy by Regions delivers the user-friendly features and expert perspectives that have made the textbook one of the top teaching and learning resources for those seeking insights into the practical application of anatomy. Ideal for medical, dental, allied health, and nursing programs, this book guides students through the fundamentals of human anatomy, explaining the how and why behind each structure, and offering readers the hands-on guidance they need to make sound clinical choices.